Even though it has been over a 100° for several days, we still have yard work to do. The backyard stone retaining wall had been listing for a few years, but this winter totally collapsed in two places. No getting around it any longer. The wall had to be replaced with a new one. The purpose of the retaining wall and terraces is to direct water away from the house and to control the direction rain water flows. Part of the dilemma was how to replace the old weathered Austin limestone wall with a new wall that would also have some old world charm of its own. Something French-inspired, but within the budget. The solution? 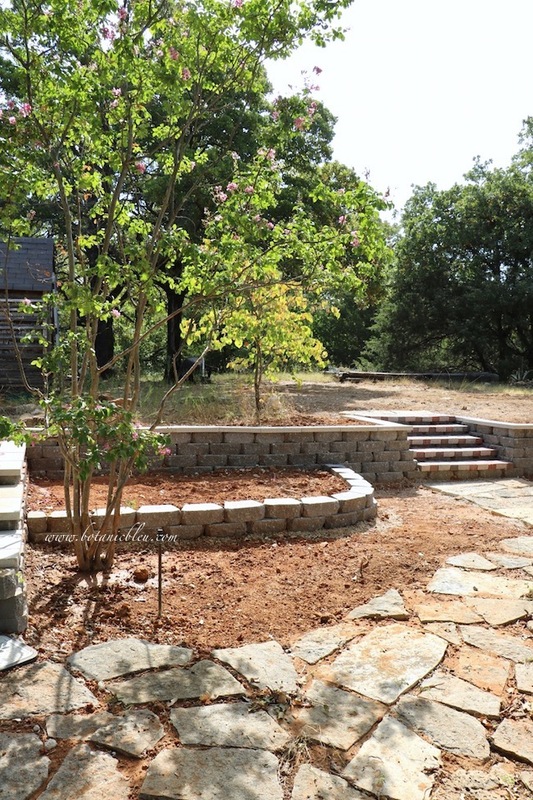 Blend the old existing lower curving limestone wall with a new upper paver gray stone retainer wall and keep existing weathered large flat stones as walkways. Curved limestone walls replicate the look of fortified stone walls that surrounded medieval cities in Europe. Château d'Angers, France, which became home to French kings in the 1200s, was protected by white stone and black slate rounded towers. Why do falling down walls in Europe look utterly charming, but falling down walls in my yard only look dangerous? Where is the charm? And, where is my team of gardeners, wearing berets and wielding vintage tools, to plant and to maintain a French potager and flower garden? Last summer the wall was leaning badly and had a few missing stones. During the winter, a section of the wall in this area totally collapsed. Another section of the wall also collapsed. Renovation always has a few surprises planned. 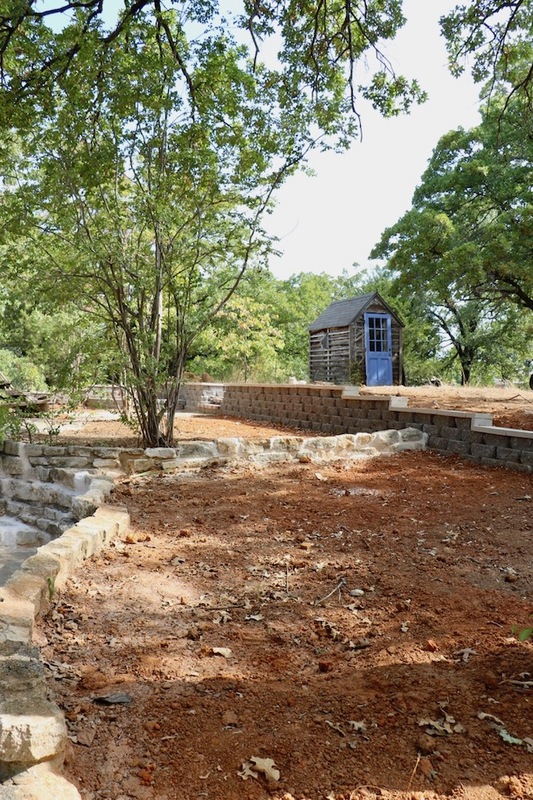 A landscape crew was contracted to remove the old stone retaining wall and to replace it with a new paver stone block wall. The cost of a new limestone wall was out of the budget since I had to pay for both the materials and LABOR to install the new wall. When we built the original limestone wall almost 30 years ago, we did the work ourselves, a little at a time, which saved over half the cost of the wall. The new pavestone wall is moved back about 36"-72" from where the old stone wall was. We need to replace a set of old wooden stairs going up to the storage area above the garage and need more space than the original stairs took. 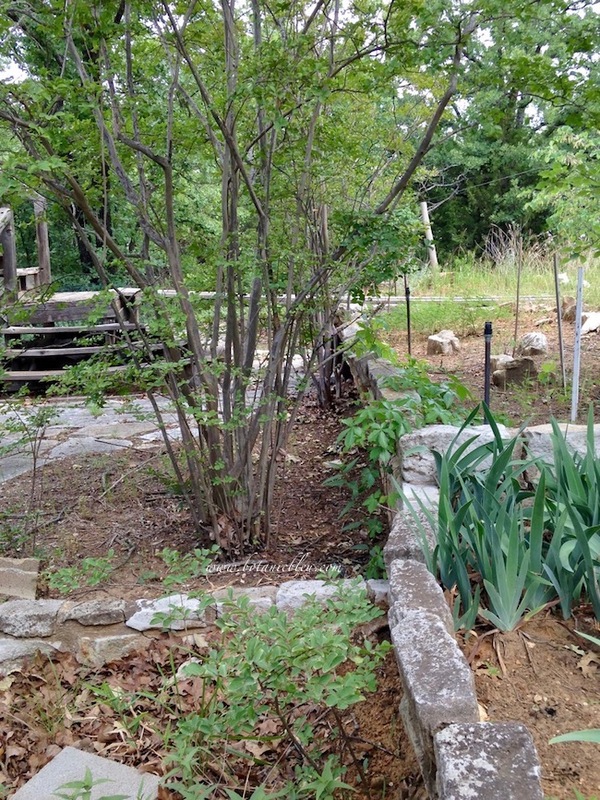 The flower bed in the corner was required to cover an existing buried water line with enough dirt to prevent the line from freezing in the winter. The line drops down and is sufficiently covered in the lowest terrace level. 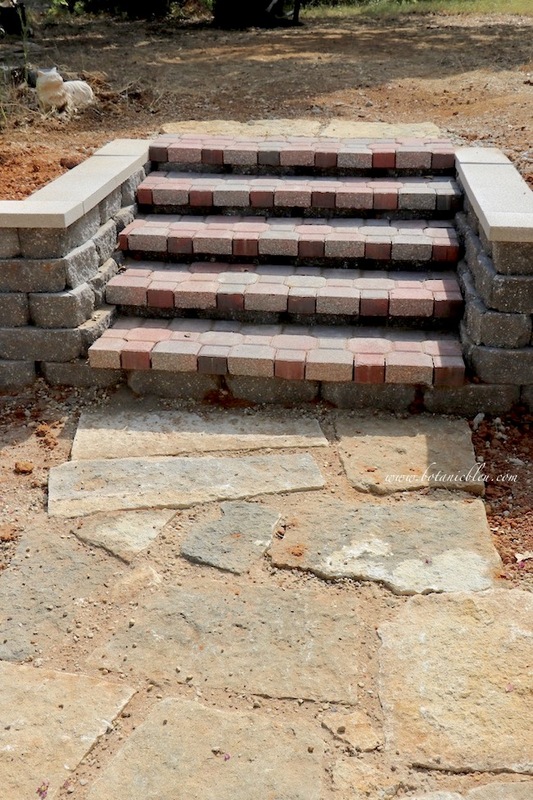 Brick paver steps connect the lower terrace to the upper backyard. 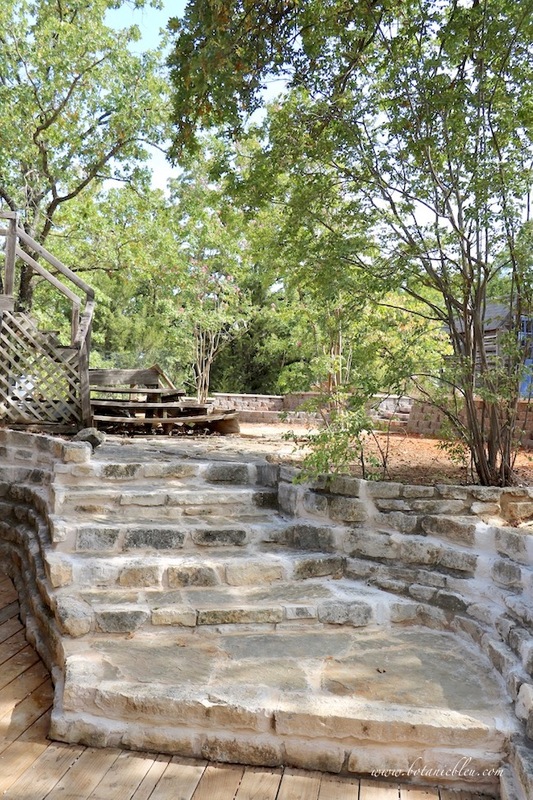 Existing large flat stones were relaid to form walkways on the terrace below the new retaining wall. 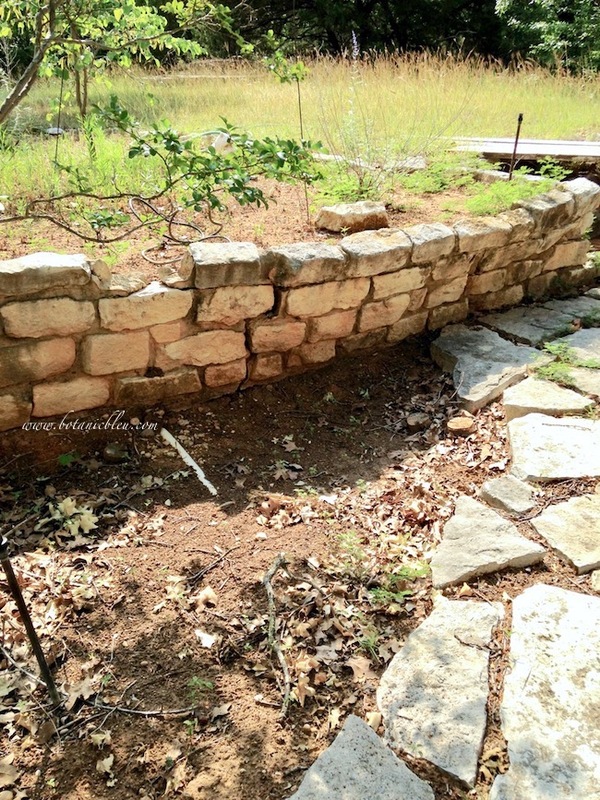 This photo from last summer shows more of the old stone wall's position and condition. You can tell how much farther back the new wall is from the old wall's position by looking at the line of crepe myrtle trees. The old wall ran next to the three trees. 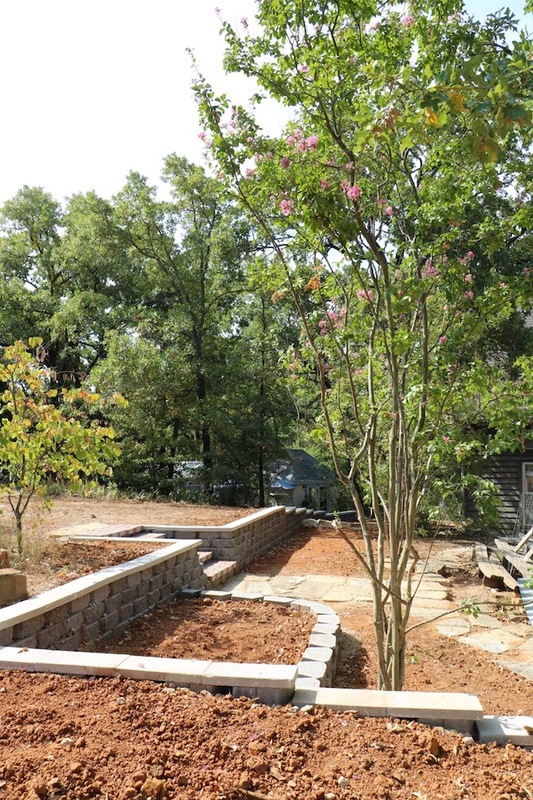 Later when the weather is cooler in October, the middle crepe myrtle tree will be transplanted closer to the new wall to give more room for repositioning the wood stairs that lead to the area above the garage. 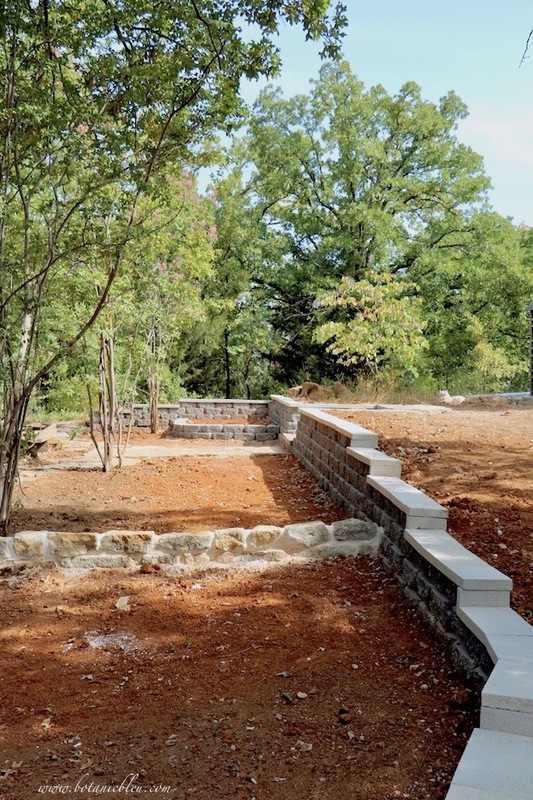 An existing low stone wall was extended to the new gray paver block wall. There is a difference in the height of the flat terraces on either side of the low stone wall. The wall helps control rain run-off. In the fall, I will improve the quality of the red clay soil by adding humus and sand. Then the terraces will be ready to plant. Old irises will be replanted. No other plants have been finalized. Dreaming of lavender plants like in France in the sunny areas. Any suggestions for Zone 8a cold hardiness / Zone 9 heat hardiness plants? 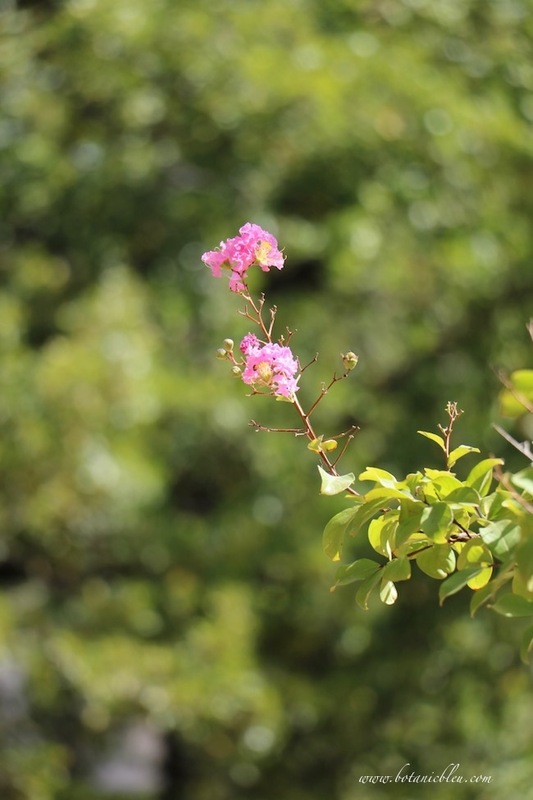 Zone 8a cold hardiness means temperatures can plunge to 10°-15° at least once each winter. Zone 9 heat hardiness means there are 121-150 days > 86°. Yes, the weather in my neck of the Texas woods is difficult. We get both extremes, cold and hot, during a year. Notice there is a sunny area and a shady area. The photos were taken around 9:30 - 10:30 a.m. 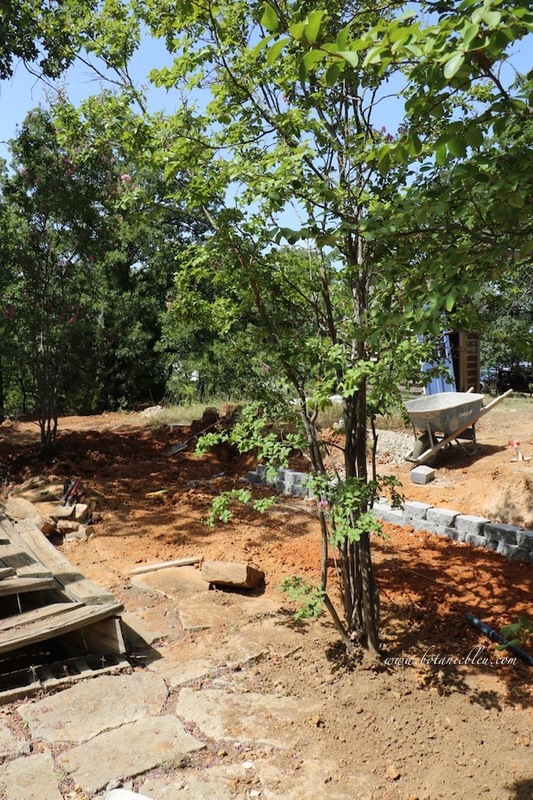 The entire area becomes more shaded by the house and garage in the afternoon. A water-and-heat stressed redbud tree (left side of photo) is on the upper level of the backyard. 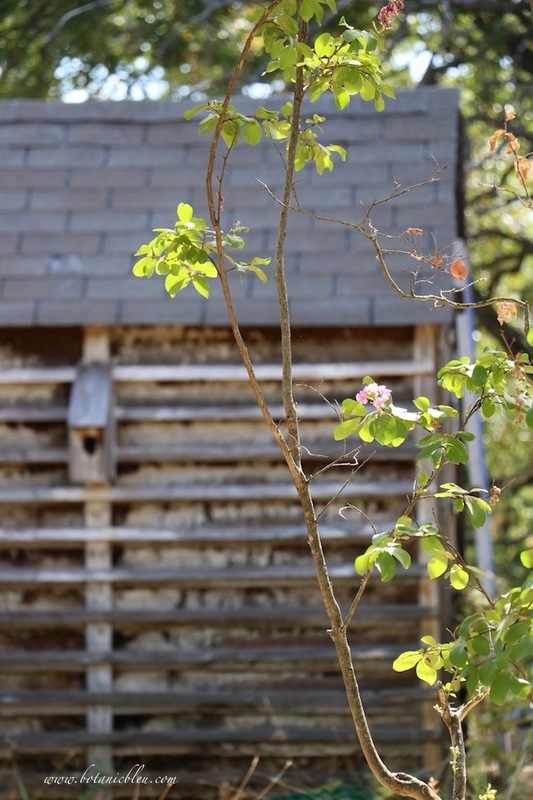 Crepe myrtles are hardy drought-tolerant plants that are still blooming after mistreatment by the landscape crew while removing the old wall. The tree in the foreground had several limbs damaged or broken off plus several inches of dirt covering its base for about three weeks. The wonder of it all is the plant is still blooming. The stone steps were repaired last summer. The wooden stairs to the storage area above the garage will be replaced a little later this summer when the temperatures drop some. Next on the to-do renovation list will be the old well house that protects our water lines running from the public water supply to our house. The well is no longer used, but the public water lines connect through the water pipes original to the well. Upkeep and renovation are not only part of a fixer-upper house. They are also an ongoing part of houses built by homeowners themselves. 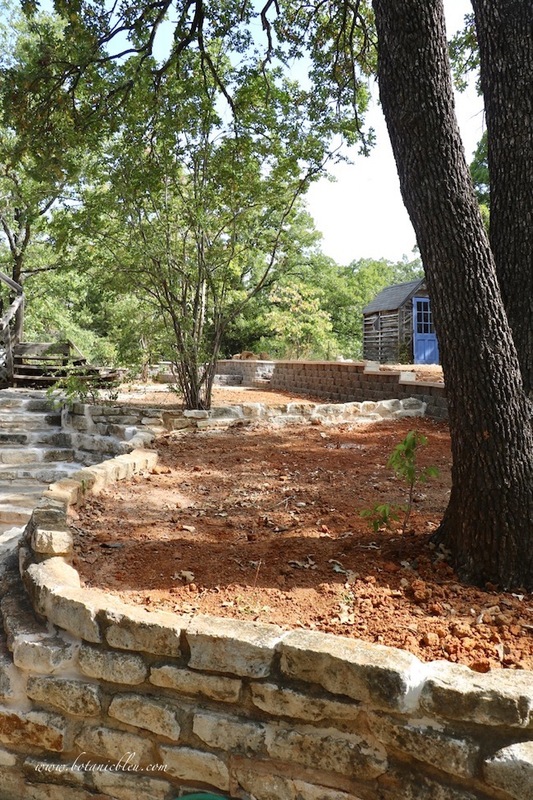 Replacing the backyard retaining wall with a new charming wall is the latest required renovation at my house. What are you repairing, updating, renovating at your house? You may be interested in determining the heat and cold hardiness zones for your garden. Upkeep never stops:) My projects are much smaller but one is related to rain water. My sump pump drain partially collapsed and the outdoor drain system could not handle the large amounts of water after heavy rains - so I decided to do a dry creek bed for half the run and connect it to the newer pipes done a few years ago that connect to the storm drain. This led to removing part of my sidewalk as the creek runs through it- now have to figure out a bridge of some kind - and this is the front yard. I've hit my budget limit and need to finish it myself - doable, but not how I had planned to spend the next few weeks. My dryer is also not working and there are several loads of beach towels and clothes since we just returned from a lazy week by the lake - repairman is on the way. All in all I feel lucky I have a house to repair, and while I would love to have a landscaper finish my project, there is something positive about working on your own place when you can. Your project is going to be lovely. I would feel overwhelmed about the amount of planning and planting to be done - but it will be fun too. The weather report here in Iowa has highs only in the 70's tomorrow, so a good day for being outside! I love what you've done ! The landscape is so very important to me, and I'm kind of a nut case about pruning. As you know, I live in Houston, my daughter is in Wimberley, Texas, the summer's are dreadful, so I totally understand what you're saying. And, then there are the deer to consider. Are you looking for permanent plantings, like Azalea, or bedding plants here and there? I'll think about this and get back to you. Tell me again where you live, please. Sending a big huge congrats on getting this project done, it looks wonderful, like it's always been there !!! 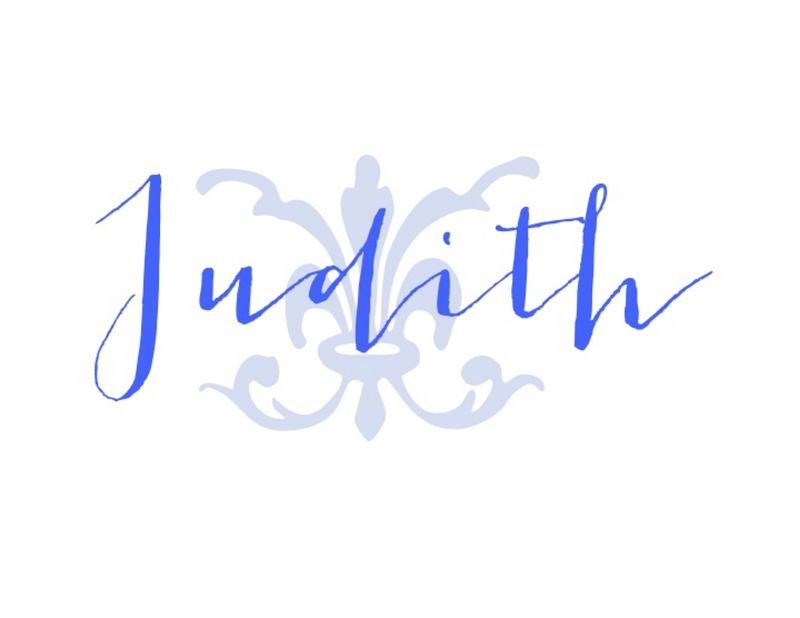 Judith your area is going to be gorgeous, actually it already is. The stone is fabulous. About your planting zones and lavender. I lived for 32 years in zone 8 - coastal Virginia. The coldest I ever experience was -1. However, I am now in zone 5a - quite a difference. We regularly see -12 for several days during the winter. Just this past spring we lost a tree in our garden and we have stone work around the area. I placed an old olive jar and planted lavender all around the jar. What I planted was a variety - Lavandula Grossa. It is good to zone 5 thru 8. I don't know about your summer heat though. Like you, I can see lavender in your area. Our TX heat isn't the best time to work outside, but one's got to do what one's got to do. I know you will be happy to have this project finished. Your property is charming, Judith. I admire your sense of style. Stay cool!